Review: The Ace Decoy Anchor is a molded lead hook that attaches easily to the keels on most production decoys. It does away with the need to wrap a lead strap anchor around the neck and damage the paint on your decoys. It definitely helps to keep your decoy sack much more tidy and ordered, and makes deploying your decoys a lot easier and quicker, especially in the dark. The lead hook is attached to a length of heavy-duty rubber tubing, which is then attached to your decoy line. When wrapping up the decoy, you simply wrap around the keel until the rubber tubing is tight and then set the lead hook on one end of the keel. 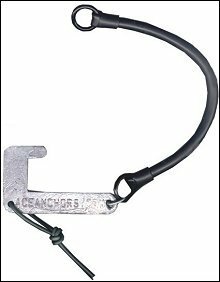 I like the Ace Decoy Anchors a lot, and I have used them a lot. I do need to say, however, that to keep them in tip-top condition for more than one year of use, there is a fair amount of upkeep/maintenance. The upkeep involves the rubber tubing. If left wound tightly on the keel for more than the duration of duck season (more than 2-3 months), the rubber tubbing will begin to "dry-rot" or decay, eventually making the rubber tubing useless. Because of this, the manufacturer recommends that the anchors be stored UN-wound during the off-season, and that they be rubbed with "Armor-All", the stuff you use on the dash of your car. They claim this will keep them supple and easily used for more than one season. Personally, I have never tried this, so I have had a number of rubber tubing attachments dry-rot. Replacement rubber tubing can be purchased. I recommend the Ace Decoy Anchors strongly as a good, practical product for duck hunters, if you don't mind the maintenance on them or replacing the rubber tubing every year.